Organic farming has taken root in Cuba because of a shortage in chemical pesticides and herbicides. Maybe the U.S. trade embargo isn't all bad. Havana, Cuba, can leave you with the impression that time has stood still. 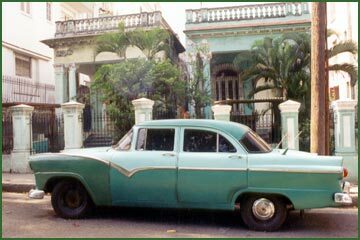 A 1950s Chevy will cruise by, it's rusted hulk kept on the road by ingenious Cubans who can somehow turn a junked piece of metal into a gasket or cylinder. Architectural gems are literally crumbling into dust, and bicycles negotiate through pot-holed Havana nights made darker without electricity. In Cuba, shortages are a way of life. Beginning in 1962, Cubans have had to cope without many basic necessities. Soap, toothpaste, clothing, and even food became hidden treasures when the United States imposed its trade embargo and effectively severed the island's lifeline. The thinking was, cut off their ties and the upstart revolutionaries will be forced to come crawling back. But instead of bringing Cubans back into the fold, the sanctions inspired a unique blend of Cuban resourcefulness. Because of the U.S. embargo, Cubans have learned to make do with what they have. Ask how they get by and people say "inventamos" - we invent. The struggle has spawned some far-reaching innovations. Cuba may be in something of a time warp, but its isolation has spawned solutions that could help the country in the future. A stroll through Havana reveals one such initiative: sharing the grey streets are pools of lush, leafy greenery. A new form of farming has taken root in Cuba. "This is a far more holistic approach to agriculture," says Dr. Fernando Funes-Aguilar of the Havanna-based Grupa de Agricultura Organica. "Is this good for Cuba? Sure and it's getting better. We have had many advances in the last few years." The energetic farmer is part of a growing movement that has transformed the island from one of the most lagging agricultural producers to a leader in alternative farming approaches. In just a decade, cities and towns throughout Cuba have filled vacant lots, old baseball fields, rooftops, and any scrawny spaces with gardens - many of them free of pesticides and herbicides. Urban and organic farms, Funes says, are growing because of basic needs, hardly surprising in a country where necessity is indeed the mother of invention. "In Cuba, a lot of the farming is organic by default," says Ralph Martin, a professor at the Nova Scotia College of Agriculture in Truro who has done extensive research in the Caribbean nation. "They haven't had the money for herbicides and pesticides, so they've had to come up with ways to farm without them." The transformation began in 1989 when the Soviet Union, barely coping with its own economic depression, staunched the financial aid that had poured into Cuba for more than 30 years. In a matter of months the island was pitched into its darkest economic crisis, no longer able to rely on highly subsidized imports from Russia, or on the inflated revenues it received from sugar sales to the Soviets. The impact was intensified by the Helms-Burton act, U.S. legislation that put the squeeze on businesses trying to set up in Cuba, and punished those companies already operating on Cuban land that Washington believes was illegally expropriated from Americans. Cuban President Fidel Castro responded by introducing severe restraints and cutbacks in 1989, euphemistically known as the "Special Period." Electricity, fuel, clothing, medicine, and food would be in much smaller supply. Between 1989 and 1993, Cuba's total imports shrank by as much as 70 per cent. Agriculture was one of the industries hit hardest by the Soviet withdrawal. Pesticides and fertilizers needed to grow food for domestic use and for export were gone. Petrol for trucks delivering produce to large markets became scarce. The flow of heavy farming machinery imported from Russia suddenly stopped. Broken down tractors sat idle in fields because farmers had no other suppliers to replace parts. Cuban farming had become so reliant on Soviet-supplied chemicals and machinery that without them it ground to a halt. Statistics can only hint at the human costs: the decline in food production led to an estimated 30 per cent drop in caloric intake in the early 90s. The average daily per capita protein consumption dropped 27 per cent. Havana, a city of about 2.5 million people, was hit the hardest. Located on the island's north coast and relatively isolated from farming belts, the capital found itself in the midst of a major food shortage. Fuel needed to transport and refrigerate food from rural farmlands was in short supply, and state rations meant to provide for a month only lasted a week. Frustrated by the deepening shortages, many Cubans took matters into their own hands. Literally. They started growing their own food, even in urban Havana. Martin Bourque, head of Food First's Cuban Organic Farming Exchange Program, based in Oakland, California, says people headed to their backyards, rooftops, and neighbourhood lots to sow seeds. At first, the initiative involved only a few plots and contained a handful of root vegetables. But it quickly grew popular as residents realized they could supplement their meagre government rations. "It's been a real evolution. Originally it started when people took over land and found something to grow on it," says Bourque, whose group shares information and expertise with Cuban farmers. "Now you drive down streets and see a house, a building, and then a garden. Every time I go I'm amazed at how successful it is and how big it is." 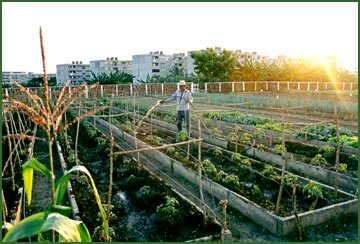 The most prolific gardens are the self-provision plots that have sprung up in Cuban cities across the island. These are small parcels of land maintained by individuals and only modestly regulated by the central government. 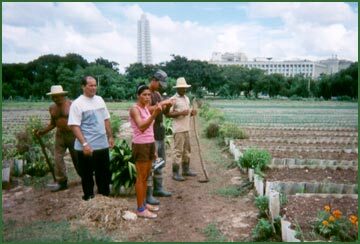 Many of the estimated 30,000 private gardens - huertos populares - in Havana's 15 municipalities are small tracts that produce traditional crops like yucca, taro, cilantro and onions, and can provide 30 per cent of people's food. Businesses, schools, and hospitals have also carved out gardens to supply their kitchens and cafeterias. In one small plot minutes away from the Plaza of the Revolution in central Havana, Jorge Antunis plucks grubby roots from the soil. "Years ago," he said in an interview with the development magazine New Internationalist, "there was nothing planted here." The garden, about a thousand square metres, now provides Antunis and the six other families that live next to it with bananas, tomatoes, sugar cane, yucca, plantain, and beans. "The land was rocky and worn out at first. One of the first things we had to do was rebuild the soil with new organic soil and manure." Cubans have filled parking lots, baseball fields, front lawns, and rooftops with urban gardens. The Cuban government, long known for its discomfort with personal gain, uncharacteristically got behind the movement. The Ministry of Agriculture quickly saw the potential: individuals and groups working small farms could cheaply produce enough food to alleviate hunger. In 1991, the ministry took steps to officially recognize the farms, and introduced a program called 'Linking People to the Land' that made workers directly responsible for land on state farms and the produce they yielded. Perhaps to show its lack of immunity from the shortages, the ministry converted its own lawn in front of its 20-storey glass and concrete office into a garden to provide staff members with yucca, bananas, and beans. "For everyone who walks in and out of that building, it has a huge impact. It says, 'We're not just saying it, we're doing it,'" says Bourque. The ministry also set up hundreds of resource centres where residents can buy supplies and get advice on what to plant and how - without the use of pesticides - to prevent pests from destroying crops. Every neighbourhood in Havana has a staff member who oversees the gardens and helps them obtain land, form community clubs, and answer technical questions about gardening. "People had lost their agricultural history and didn't know much about where to go, what to grow or how to plant seeds," says Bourque, who spends at least a month in Cuba every year. But instead of returning to the old methods that relied on noxious chemicals and gas-fuelled machinery, scarcity is forcing farmers to use environmentally friendly approaches. Because pesticides are rare and even illegal in some cases, farmers are producing almost entirely organic crops. Agronomists have also developed an impressive array of biological weapons to deal with pests. Oxen are also being bred to replace Soviet-era tractors that rely on expensive and scarce fuel. The south coast province of Cienfuegos is one of the best models of these new farming approaches. There are more than 50,800 large and small private gardens in the province and more than 120 gardens in the city of Cienfuegos. The town took up the call in earnest, driven by the need to feed its 156,000 residents and develop alternative ways of farming. 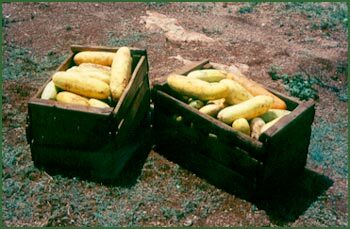 "In Cuba this is a popular movement that has been supported by the government as the only way to face the food crisis due to the collapse of the socialist block and the U.S. embargo," notes Alejandro Socorro, a professor of agro-ecology at the University of Cienfuegos. "They are in underused urban spaces like ex-parking areas, empty lands inside the city. The problem now is to find new growing areas, so for that reason the potential is going to the suburbs, to the borders of the cities." In a former baseball field just outside Havana, workers at an organipónico, a state-run organic farm, have devised a completely natural way to tend their crops. Plants are sown in raised cement beds and fertilized with decaying coconut leaves from nearby trees. Manure is collected from canvas bags that are attached to horses plowing a neighbouring field. A natural pesticide has been developed from the crushed leaves of the Neem tree, which is indigenous to India. And compost is taken from a vat full of worms that break down waste into rich soil. "They're very sophisticated," says Martin, adding that the country is already being looked at as a model for other nations. Bourque says Cuba is way ahead of other nations in its development of biological pest controls, which have already been imported to other Central American countries and could be used in many poorer regions of the world. Or richer regions of the world. Necessity is forging alternatives in other sectors as well. Cubans are experimenting with solar energy because of electricity shortages. And the world of medicine is also undergoing its own revolution, as doctors look for other ways to treat people without scarce medicines. When the Soviets pulled out, they took with them a steady supply of modern antibiotics. That caused Cuba to invest in alternative treatments - like homeopathic remedies, acupuncture, and natural tincture - and to encourage urban gardeners to grow their own medicinal herbs. The shortages are also causing a philosophical change on the island. "The special period has been a great teacher for Cuba," says Marta Perez, director of natural and traditional medicine for the Ministry of Public Health in Havana. "Because in the midst of this difficult situation, we had to find a way to fight back." If invention is the daughter of necessity, Cuba is proving itself to be a model child. 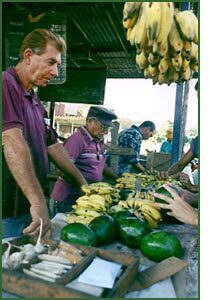 Bourque agrees that Cubans are starting to view the embargo and the deprivation in a different light as they see how agriculture and medicine, nearly thwarted by the shortages, have changed course and are blossoming into healthier, stronger industries. "People refer to it as the silver lining of the hardship." The eating habits of Cubans have improved, and many are returning to a more traditional diet lost when imported, canned foods elbowed out conventional and healthier food in the 1980s. Cubans are eating more vegetables now than they did 15 years ago, and they like the fact that they can buy produce in newly privatized markets. Cubans can also make money from the Unidades Basicas de Produccion Co-operativa, the remnants of lethargic state farms that were dissolved by the government in 1993. Workers inherited farm equipment, machinery, and the right to sell surplus produce at a profit. 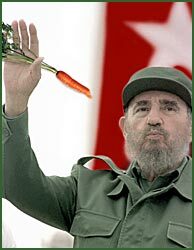 It's an enticing carrot for most Cubans who make about US$15 a month and can earn about $40 from a farmers' salary. The appeal has been so great that the new agriculture has created a minor backlash and 'brain drain.' As professionals see farmers bringing in extra money, some are fleeing engineering and medical careers to head back to the land with the newly coined "campesino millionaires." "It's become a point of contention because many farmers on state land are doing quite well and some people think, 'That's our land and they're making good money at it,'" explains Bourque. The urban farms and the larger state farms haven't been without problems, however. "There is a very long list of challenges for urban agriculture in Cuba," says Professor Socorro. "The main problems are the availability of water, land and seeds, and the soil quality." Water is in short supply, since Havana sometimes has water service for only two hours every other day. Urban farmers have had trouble improving soil that has been contaminated after years of exposure to harsh diesel fumes and litter. But as is the custom in Cuba, people find ways around the obstacles, building raised beds in areas with poor soil, or trucking in organic fertilizers to restore it. Paradoxically, the very factors that helped create the gardens might be what leads to their demise. Some fear that the inevitable end of the embargo might encourage people to return to more conventional methods of farming. Chemical fertilizers, tractors, and food will undoubtedly become available again when the Americans move in. Like the Victory Gardens that flourished in the U.S. during World War Two and then disappeared when it ended, observers wonder if Cuba will maintain its commitment to this new agriculture, borne out of necessity. "Clearly, the driving force was to produce enough food, not to produce organic food," says Ralph Martin. "Some people are waiting for the shortages to end so they can go back to the way things were." But, fortunately, many are not. "I think these farms are pointing the way ahead." Cuba is now far ahead of other nations in organic farming techniques. "We may be going to them someday and asking advice." Alison Auld is a Halifax-based journalist. The Lonely Planet website is a good source of info on travelling in Cuba.